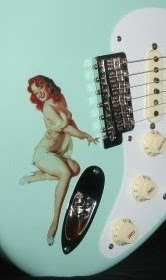 Here's a '59 style Fender CS, Yuri Shishkov Masterbuilt Surf over Burst, Ultimate Relic Strat built in 2008. Seller provides no specs in the listing. Lots of cool pics with crazy background and shadow effects though. Yeah, I'm easily amused. COA, candy and OHSC are included. Is the guitar in good shape? Uh, yeah I guess... for an Ultimate Relic. A phone # is in the listing, so call 'em for details, full coroner's report, etc. Schedule a colonoscopy or whatever. Seller: groovyguitarnj aka Groovy Guitar is NJ based, and lists some cool gear as well as a '68 Corvette at the moment. The Music Zoo also stocks lots of Ultimate Relic models.